The Newport News I-64 Speed Trap: "Don't Say We Didn't Warn You" | Swango Law P.C. Virginia is notorious for its stringent, harsh, and unforgiving traffic laws. Out-of-State drivers are often surprised when they finally understand the gravity of the traffic charge or charges they accrue in the Commonwealth, only after they face serious consequences and it is too late to find the best traffic lawyer for them. We recently discussed a New Jersey driver who was jailed for reckless driving in Virginia. One thing is for certain: drivers traversing Virginia roadways must always remain alert, because speed limits often change drastically without much advance warning. For example, traveling on Interstate-64 can lead to much frustration if you are pulled over and cited for speeding in a 55 or 60 mph zone, when just miles earlier, the speed limit was 70 mph! Contributing to the confusion – the fact that often these drastic drops in speed limits occur in areas where the roadways intuitively seem as if they would be safer to travel at a higher speed. But be warned: traveling 80mph or more can be catastrophic to your wallet, your driving privileges, and even your freedom. Your trusted Virginia Traffic Defense Attorney explained these consequences in more detail, in his article here. Below is one of the most unintuitive locations in all of Virginia when it comes to the speed limit. As described above, this corridor of I-64 includes a stretch of highway that transitions from two lanes to four lanes, however, the speed limit drops significantly. 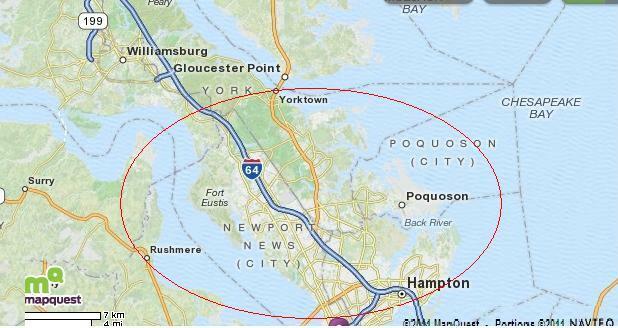 This area is just before drivers reach Newport News exits and continues through the Hampton Roads Bridge Tunnel – a nightmare unto itself. If you are an out-of-state driver or a Virginia driver caught off guard and issued a citation, do not take your charges lightly. Your Virginia Beach and Norfolk Traffic attorney is ready to work hard to ascertain and pursue your most favorable outcome. Results can never be guaranteed, but the work ethic and level of dedication promised to you by your attorney can be.